Rendered in an attractive sea blue, this Round Greek Lantern Fish Wooden Shield features Greek styling and a stylized depiction of the deep sea lantern fish. This shield is made from strong composite wood and hand-painted with artist-grade paint. The center of the shield depicts what looks like a fish in the sea. The background features an airbrushed blue-fade design that is somewhat reminiscent of water. The central design is a black, stylized lantern fish, rendered here in black shapes with sharp lines. The fish is curled around in a circle, its head resting near its tailfin. The border of the shield is black and is set with several decorative metal studs. The shield measures approximately 25 inches in diameter and is made entirely from 0.5 inch thick smooth composite wood, which is considerably stronger and more durable then plywood. The back of the shield features dual leather arm straps, which provide a comfortable and secure way to use the shield. One strap loops around the arm while the other is gripped by the hand. The front of the shield has also had several topcoats of varnish applied, in order to give added protection against the wear and tear that go along with time and use. 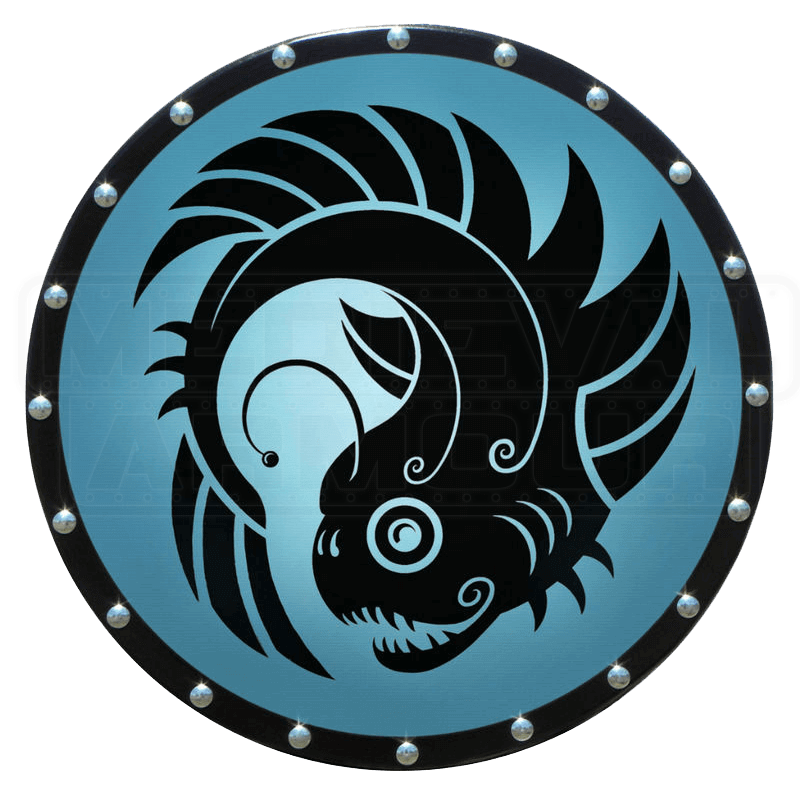 This shield is big enough to cover your arm past the elbow and strong enough to serve as a sturdy defense if used in combat, yet it is also pretty enough to hang on your wall as amazing decoration. The Round Greek Lantern Fish Wooden Shield is a great shield to add to Greek hoplite costume or knightly costume at your next Renaissance fair. You can keep it as a personal decoration or give it as a gift to a medieval-era enthusiast!